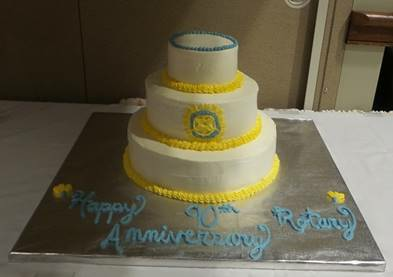 On Aug 30, 2015 over 100 Rotarians, family and friends gathered at Shadowbrook Inn and Resort for a celebration of 90 years of service by the Rotary Club of Tunkhannock. Master of Ceremonies (MC), Assistant Governor (Cluster 2) and Past Club President Norm Kelly called the meeting to order. Past District Governor (PDG) David Whipple (Rotary Club of Tunkhannock) recited the 4-Way Test of the things we think, say and do. 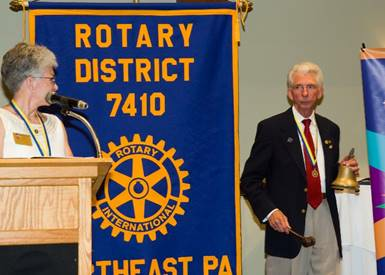 Tunkhannock Rotarian Fran Turner led the Pledge of Allegiance and Tunkhannock Rotarian Rev. Lou Divis gave the invocation. After a delicious buffet dinner, everyone enjoyed the outstanding carrot cake made by Culinary Institute of America graduate Pastry Chef Sisile Maruzzelli, a former Tunkhannock Rotary vocational scholarship winner. 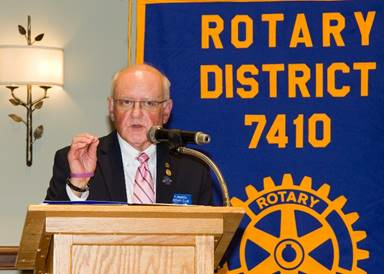 Throughout the evening, MC Norm shared with the audience notable events that happened in 1925, the year the Rotary Club of Tunkhannock was chartered. Although he stated that a test would follow at the end of the evening, none materialized to the relief of a few attendees. 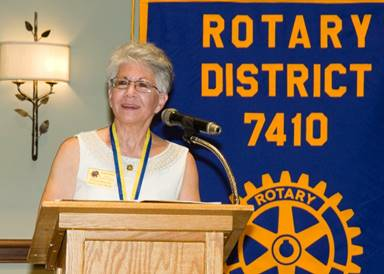 MC Norm began the formal program by introducing the Past District Governors in attendance, as well as, our current District 7410 Governor Barbara Belón. The lineage of the Rotary Club of Tunkhannock was represented by: Marty Snyder, Secretary of the Rotary Club of Pittston, the Club that sponsored the Rotary Club of Tunkhannock in 1925 and Wesley (Vice President) and Mary (Secretary) Skillings and Ann (President-Elect) and Don Burgess of the Rotary Club of Wyalusing Area, the Club sponsored by the Rotary Club of Tunkhannock in May 2015 and the newest Club in District 7410. Norm acknowledged State Rep. Karen Boback from the Rotary Club of Dallas and Commissioner Tom Henry of the Rotary Club of Tunkhannock. Norm also welcomed all the members from the Tunkhannock Kiwanis Club or as it has been affectionately referred to in Rotary meeting minutes, “the other Club”. 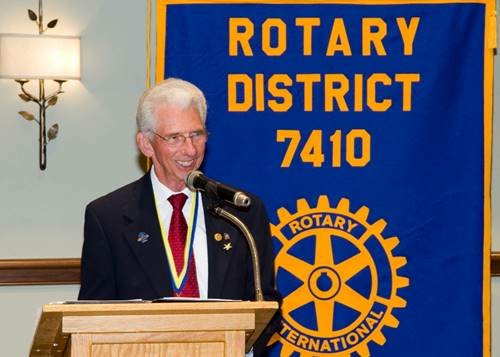 Norm then asked 65 year Rotarian Fran Turner to give his Rotary Moment. 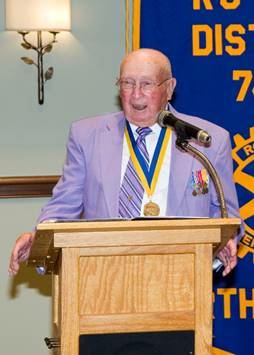 Fran shared his invitation to Rotary in 1950 in Wellsboro and his dedication to the motto of “Service above Self” in Rotary, both in Wellsboro and then after his transfer to Tunkhannock in 1960. MC Norm greeted our 3 newly-arrived inbound exchange students and asked them to introduce themselves in their native language and then in English. Club President Ron Furman then presented each of the students with the Club mini-banner. The bell and the history & significance of the bell for Paul Harris, who was raised in New England. In Rotary, the bell is used to call the meeting to order. 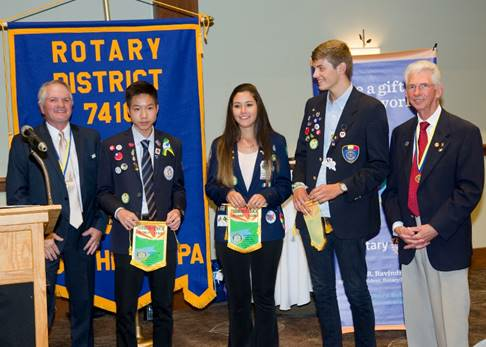 The gavel, which is very special to the Rotary Club of Tunkhannock, since there is a history of gavel-napping in the Tunkhannock Club that has occasionally required a club position of a gavel protector. The 4-Way Test formulated by Herbert Taylor (a Rotarian with the Jewel Tea Company), which is credited with saving the Club Aluminum Company in Chicago during the Great Depression. 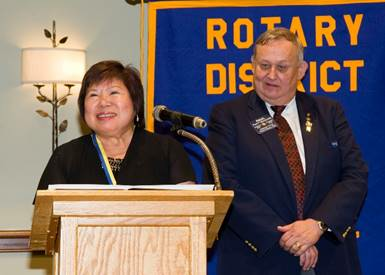 Today, the 4-Way Test is recited at the beginning of every Rotary Club meeting. DG Barbara also told a story of creative recruiting in Dec. 1905 at the Rotary Club of Chicago by Frederick Tweed, a glass ornament manufacturer. She talked about the first service project of the Tunkhannock Club that was carried on for over 50 years. From the 1920’s, the Rotary Club joined with local churches and the Order of the Eastern Star to collect food for distribution in Christmas food baskets to local families in need. She then mentioned the Farmer’s Dinners that were held for many years to honor local farmers and with guest speaker’s chosen that would be of special interest to this group. DG Barbara ended her presentation by congratulating the Rotary Club of Tunkhannock for its 90 years of outstanding “Service above Self”. for her talk to those at the Celebration. 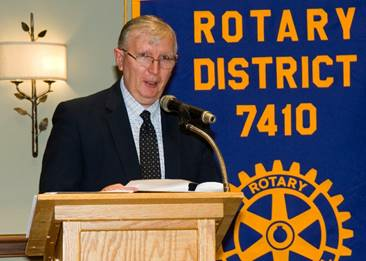 MC Norm asked Tunkhannock Rotarian John Hovan to read his very fitting contribution from the 90th Anniversary Program. Before John read his contribution below, he also read an original poem he composed at the request of 90th Anniversary Committee Chairperson Carol. In the last ninety years, the Tunkhannock Rotary Club has been guided by the principles of ‘Service above Self’ and the ‘Four-Way Test’. O! win them back again. 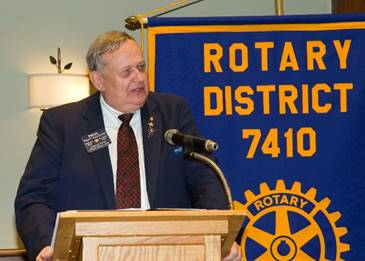 PDG and District Rotary Foundation Committee Chair Paul Muczyinski (Rotary Club of Plains) talked about the founding of the Rotary Foundation in 1916 and how after Paul Harris’ death, there was an influx of money into the Rotary Foundation in his memory. The establishment of the Paul Harris Fellowships occurred in 1957 to honor those who have donated $1,000 or have had $1,000 donated in their name to the Rotary Foundation. PDG Paul spoke about some of the projects funded by the Rotary Foundation, but most especially the challenge to eradicate polio world-wide. So far this year, only 37 cases of wild type polio have been confirmed, 29 in Pakistan and 8 in Afghanistan. It is expected that next year or the year after, wild type polio cases may be eradicated world-wide. 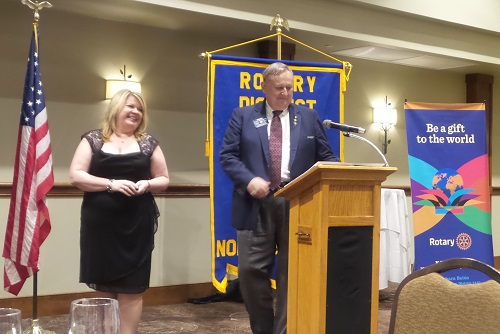 PDG Paul then asked Rotarians Al Noble and Jeannie Brady to introduce their Paul Harris fellows. 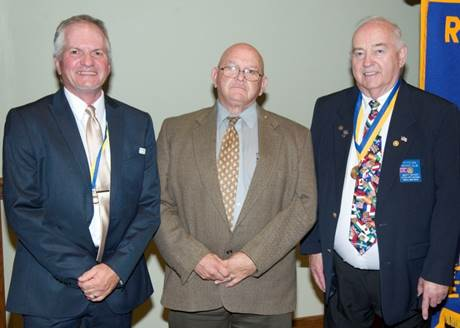 Al Noble honored his son-in-law Chris Maruzzelli, his grandson Angelo Maruzzelli and his granddaughter Sisile Maruzzelli with Paul Harris Fellowships for living and abiding by the principle of “Service above self”. Jeannie Brady then spoke about how she wanted to remember both her mother and father, both of whom have passed, with a Paul Harris Fellowship in their memory. Although she could only name 1 of them, her father Chin-Tsu Tsai, right now, she pledged to work to honor her mother with a Paul Harris Fellowship in the future. Top to Bottom: Chris, Angelo and Sisile Maruzzelli, PDG Paul and Al Noble. Jeannie Brady talking about the Paul Harris Fellowship in memory of her father Chin-Tsu Tsai. PDG Paul then presented a multiple Paul Harris Fellow pin to Past Club President Karen Fuller for her contributions to the Rotary Foundation. 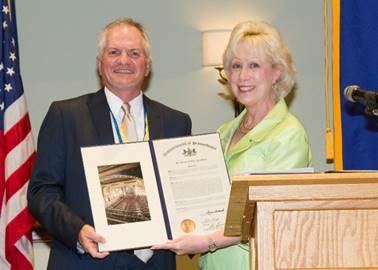 PA State Representative Karen Boback extended greetings and salutations from herself, her husband and all the members of the Rotary Club of Dallas on this 90th Anniversary of Service by the Rotary Club of Tunkhannock. 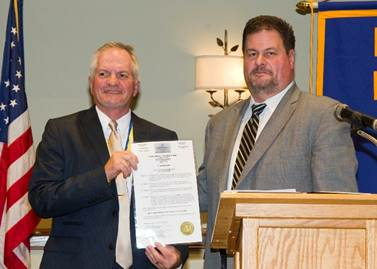 Commissioner Tom Henry, a member of the Rotary Club of Tunkhannock, presented a Proclamation to the Club from the Commissioners of Wyoming County. In the Proclamation, the Club was acknowledged as the first service club in Tunkhannock, for its charitable contributions, its sponsorship of the World War II honor roll of service men and women and spearheading the erection of the lighting equipment and Memorial Arch at Memorial Park, which is a living tribute to these brave service men and women. MC Norm Kelly introduced PDG Budd O’Malia from the Rotary Club of Plymouth, who was the keynote speaker for the Celebration. Budd talked about the Club’s activities over the last 90 years. He spoke of the Tunkhannock Club’s participation in the exchange student program (of which PDG Budd is currently outbound coordinator) since 1960 and introduced Anika Sehne, who was Tunkhannock’s short term exchange student to France this summer. 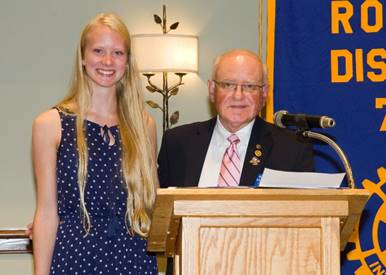 PDG Budd also mentioned the two 2015-2016 Tunkhannock Club sponsored full-term outbound exchange students: Emily Dunning who is now Denmark and Stefan Sehne who is in Brazil. 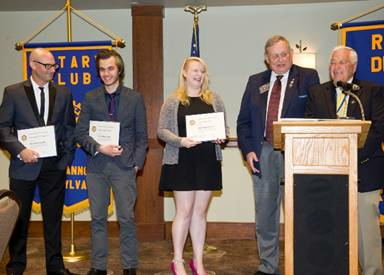 The Club’s annual sponsorship of students for the week long and life-changing Rotary Youth Leadership Awards (RYLA) at Keystone College was detailed, as was the Club’s sponsorship of the very active Tunkhannock High School Interact Club. The Tunkhannock Interactors have also embraced the guiding principle of “Service above Self” in all their projects. PDG Paul then asked everyone to use guided imagery to picture a school somewhere in the world with and without polio and the children crippled by this disease. He emphasized that this Rotary Challenge needs everyone’s support to reach the goal of a polio-free world in the not too distant future. MC Norm closed the program by thanking the members of the 90th Anniversary Committee for planning this celebration and asked everyone to enjoy the music of the Jimmy Welch Band and the dancing. The Rotary Club of Tunkhannock thanks the businesses and individuals who provided financial sponsorship to help defray the costs for this event. The sponsors include: N.E Auto Auction, Fidelity Bank, D. G. Nichols Automotive, Sherwin Williams Automotive, Jordan’s Towing, R.N. DeMECK Roof Management, Eckersley and Ostrowski LLP., ERA Brady Associates, Investment Planning Services and RJ Burne Cadillac. The 90th Anniversary Committee also thanks Glenn Holcombe for documenting this event in photos and thanks everyone who provided materials, photos and stories for the Club History or built displays for the Club memorabilia.